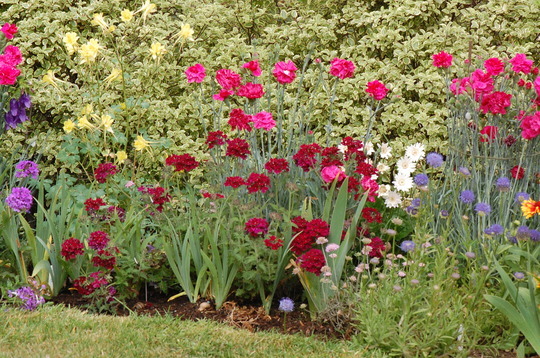 This border is infront of a pittosporum hedge, it shows the first quarter and various types of planting dianthus, verbenas, gerbera, scabious, jasione, aquilegias, irises and campanulas. Lovely dark red colour, which flower is that please? I didn't recognise all of the names you mention. Weeding, the dark red colour is the Verbena 'Claret' and the pink at the back is Dianthus 'Rose Joy'. I love the colours Louise. Glorious .... a riot of beautiful colours. My front garden is a cottage garden and the back garden's lawns and shrubs. Two very different places !